Add 80% promotion and add to basket.. Checkout for price to reduce to £9!! 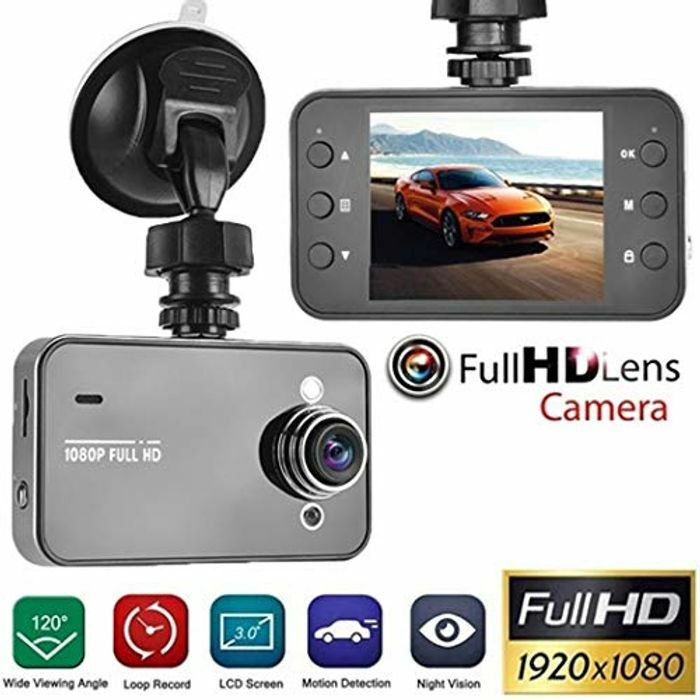 FHD 1080P Resolution & 2.7" Screen: Full HD 1920X1080P video enable to capture every road conditions and license plates details. 2.7" Super large LCD Display that can shows the real-time image, helps you see every details as clear as possible when playing back. Easy Operation & Guarantee: Easily and securely mount to your windshield in seconds with the included suction cup. Good deal, but the word glitch is being misused a fair bit on some recent posts. I think all cheaply made chinese tat is considered a "glitch" lately.. it's unbelievable how many people fall for the 80% off promotions. loveglitches I agree! .. Sooo many people think that an intentional "promotion" is a glitch for some reason. loveglitches even if it's Chinese, it can be a glitch, as long as it's not intended to be that price - either a misprice or deal stack that's not intended, but this is a single promotion intended to make it look like a great deal, so doesn't count. Even the projector the other day wasn't a glitch as far as I'm concerned - might've been a stack deal but it still wasn't "Oh my god, just buy immediately before it goes out of stock!" which is the reaction a glitch should give The 1p (plus postage) tops weren't glitches either. Junk afraid... these are very cheap, low quality and only 90°. The seller increases the price to make it look like a promotion when in fact it isn't. It is probably worth £9 but thats all. Cancel it if I were you but good luck if not. As usual with these 80% off deals this is it’s normal price. Just remember you get what you pay for. Try reading the description. The amount of megapixels is the least of your worries with a dashcam that costs 9 quid anyway. You may as well tape a Polaroid camera to the dashboard. Ziad4321 Yes you can and it'll probably be better quality than this. QUICK! Purchase before you have to buy it on Wish instead for £8. How stupid and naive do people have to be to fall for this rubbish? PLEASE don’t fall for this scam. This camera was on at this price before and then deleted the deal when it was pointed out that it’s the normal price. And then again they’ve deleted it and posted it with even more absurd claims. Unfortunately it looks like the folk behind this site are happy to be complicit in scamming visitors to their site and allow this nonsense to continue. And even at this amazing (ha ha) deal - you can still get it cheaper on AliExpress. Great to see so many people wise to this fake discount rubbish. Wtf. What’s wrong with JessHindle!!!! dss just remember, points make prizes. And comments make points. stevenw ahh. I didn’t realise that. So that’s why people continually post about how great a deal is even when it blatantly isn’t? What a stupid way of doing things!! Thanks for letting me know. It’s a great mechanism for getting folk to help fool others into falling for these scams. stevenw thanks for that. So you get points for posting a crappy deal, points for giving posts saying it’s a great deal and points for liking it too. A perfect storm of nonsense to ensure people get scammed.